If you are looking for an easy to use screen capture tool, this works great. LuJoSoft ScreenCapture will allow you to take screenshot from any part of your screen with just a few mouse clicks and you will get your first image in under a minute. This is a portable tool, so there's no need to install it. You can run it off a USB flash drive and no changes will be made to your PC. You simply specify your password and the program is ready to use. You may lock your computer by double clicking on the LuJoSoft DeskLock icon o the desktop. To unlock, press any button on your mouse and type your password. Sometimes, working on your computer might generate certain events, such as crashes, errors or unexpected situations that you might consider logging. However, sometimes logging can only be achieved by capturing a screenshot of the event and saving it to an image file on your PC. Although you can accomplish that by using Windows' native functions, you can also rely on third-party software solutions, such as LuJoSoft ScreenCapture. This application does not require any installation, as it is portable and running its executable is enough for accessing its functions entirely. Additionally, it does not change any of your Windows' registry entries, nor does it generate extra files or folders on your PC. Its main window is transparent, thus enabling you to view the area you want to capture without great effort. Right-clicking its window displays a brief description of certain hotkey controls so that you can understand them easily. This application can help you snap screenshots in an intuitive manner. You just need to place the transparent window over the object you want to capture and press the Space button on your keyboard. LuJoSoft ScreenCapture saves the area enclosed within its windows' borders and allows you to export the result to an image file on your computer. The program features support for a few formats that it can save your content as, including JPG, BMP, GIF, PNG and TIF. Benefiting from this utility's core functions requires no additional configuration, as this application does not feature any standard options menu, window or pane whatsoever. 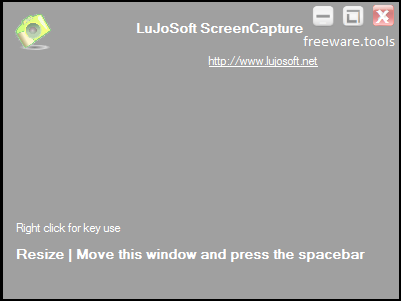 To wrap it up, LuJoSoft ScreenCapture is a lightweight, portable application that allows you to capture screenshots on your computer in a quick, convenient manner. It comes with a subtle user interface that integrates a few interactive functions, thus proving itself to be highly accessible, even for novice users.